The Pentagon has released a list of projects, including some in Washington state, that could be delayed to free up funding to build a wall along the U.S. border with Mexico. The Washington projects that appear at risk of being put on hold include an $89 million pier and maintenance facility at Naval Base Kitsap at Bangor and a $23 million maintenance installation at the Army’s Yakima Training Center. Some of the other Washington projects on the 21-page “funding pool” list include appear to be safe. They include a $26.2 million refueling facility for helicopters at Joint Base Lewis-McChord (JBLM); a $14 million support facility at Fairchild Air Force Base near Spokane; a $19.45 million Navy fleet support complex on Whidbey Island; and a $66 million project to improve a correctional facility at JBLM. Those are scheduled to have contracts awarded before Sept. 30. The Defense Department, in a statement released Monday along with the list, said projects awarded before that date won’t have their money reallocated to the wall construction. It is still unclear just what projects the Defense Department will try to bankroll. 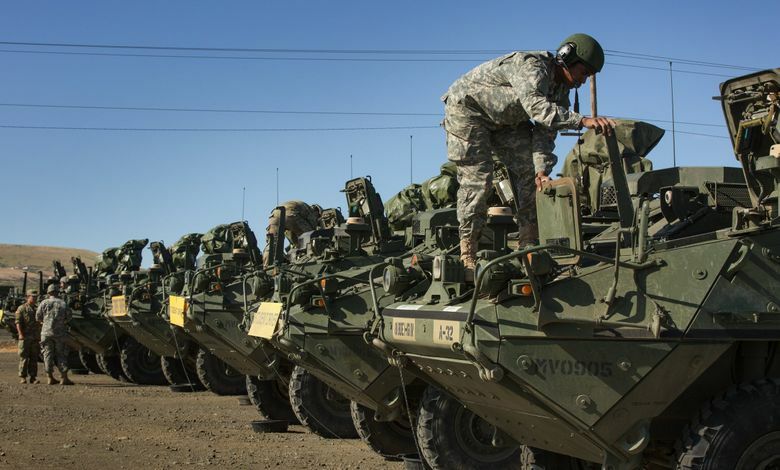 The Department of Homeland Security is to prepare a list of “border barrier projects,” and the U.S. Northern Command will determine which of them would support the use of armed forces, according to the statement released Monday. Then, the Defense Department will determine what wall-building projects it might take on, and at what level of funding. President Donald Trump declared a national emergency at the Mexican border last month after Congress limited him to just under $1.4 billion to build border barriers. He invoked a law that would let him siphon other budget funds — $3.6 billion from military construction — to build the structures and fulfill his prime 2016 campaign promise. The House voted to block his emergency, 245 to 182, in February. The Senate followed last week by voting 59-41, including a dozen GOP defections. Lawmakers expressed both concerns that Trump was ignoring Congress’ constitutional control over spending and their worries about the cuts’ impact back home. Trump vetoed the bill Friday. Gov. Jay Inslee and Attorney General Bob Ferguson released a joint statement Tuesday opposing the use of funds for border-wall construction that were scheduled to be spent in Washington state. Inslee and Ferguson are “closely monitoring developments,” the statement said, and will file a lawsuit if a final decision is made to redirect money from Washington projects. Many congressional representatives also have expressed concern about projects on the list. They include Rep. Denny Heck, D-Olympia, who voted against the president’s emergency declaration. Rep. Derek Kilmer, a Washington Democrat whose district includes Naval Base Kitsap, said that the pier extension project at Bangor on the list would allow all three Navy Seawolf-class submarines to be homeported there. “The message from Congress is loud — do not cut these vital military projects,” Kilmer said in a statement released Tuesday. If the Defense Department’s proposed budget for the fiscal year is enacted on time and as requested, then it is possible that no military projects will be delayed to fund wall construction, according to the department’s statement. But the opposition to Trump’s use of an emergency declaration to fund wall building has triggered a thicket of lawsuits, which could thwart plans for building new barriers along the border. Some wall projects also may face legal action from landowners along the border.